Tags: Autumn, challenges, Inspiration, Motivation, Randy, success, winter. Happy Anniversary, Autumn! Four Years Already? 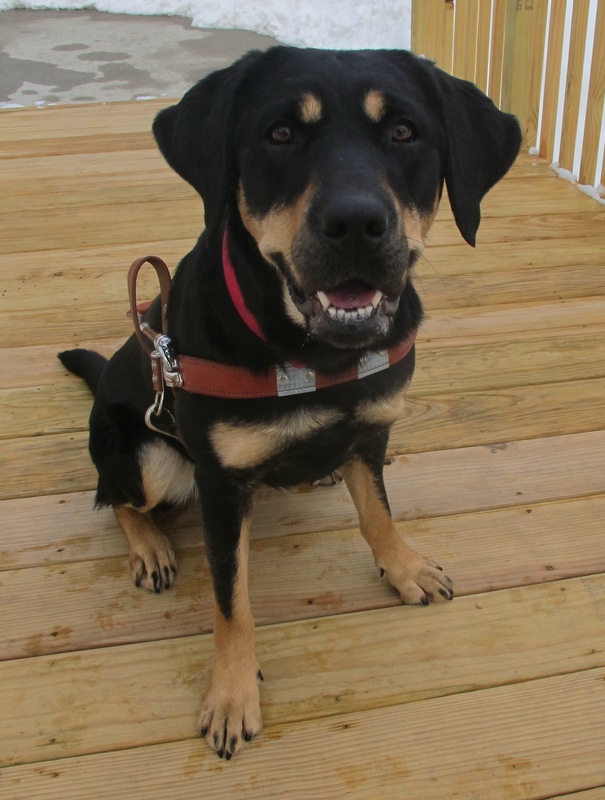 Here is the first picture of Autumn, Randy’s Guide Dog partner, who arrived in Nashua on March 16, 2014. Happy Anniversary! It is so easy to celebrate every single day with such a joyous, loving lady as Autumn! She is far and away the most affectionate pup I’ve had the fortune to have in my life and I’m told it is to my benefit that I cannot see the “look” with which she would otherwise put me at her bidding! March 16 will denote four years of our being matched as a team, which includes not only the wonderful relationship as a great dog but also some pretty solid guide work. Most dogs love the opportunity to step out for a walk and Autumn is no exception. What makes her and all of our Guide Dogs particularly exceptional, however, is that for them each walk is a true labor of love as well. All the wonderful distractions of the world are mitigated by her training to ensure she tends the responsibilities of keeping me safe. Thus when a winter Nor’easter named after her predecessor, Quinn, has deposited more than a foot of snow on our roads, things get a little more interesting. As such, I thought this week I would take you on a short half mile audio/video walking tour of Autumn’s work with me. I hope you enjoy as much as I certainly enjoy having this wonderful girl in my life. Thank you, Autumn, and Happy 4th anniversary! Tags: Autumn, Inspiration, Randy, winter. 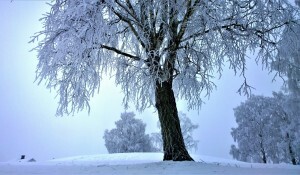 The New Year dawns on the frosty 2020 Vision Quest Team! Just as the Winter Solstice begins the lengthening of the day, so too does the arrival of the New Year bring about reflection for many of us. So many moments over the last year or even many years captured in our minds as a frozen moment of experience we can no longer change or affect. Nostalgia can be emotionally potent and despite the myriad marvels of 2017. I will not hide that the most powerful images for me are the bitter-sweet recollections of my beloved and now deceased mother. Sweet because so many of the memories are richly laced with the love and attention we chose to share our lives; bitter because I know 2018 and beyond will not hold the possibility of creating new moments together as we did so well most of our lives. As an icy cold winter has presently embraced New England, Autumn and I are not frozen in time as the above photograph might suggest. We are in the prime years of our work together. As we shelter in the warmth of our home and hearth, we are planning the possibilities for the year(s) ahead. We often share the goals of 2020 Vision Quest through our school presentations and our corporate keynotes. For this blog I wanted to share just the simple goals which warm the moments, days, and year for Autumn and me. Each and every morning begins with Autumn crawling onto my chest to lay stretched atop me in either affection or dogged determination to convince me by gravity to feed her sooner than later! Each morning she hopes to inspire me to put the harness upon her and take a walk of at least 2 miles and hopefully 4. Each morning the Playment (payment) plan ensures that following that work is a round or seven with a favorite toy of which she has roughly 54! Mid-morning she wishes to interrupt my computer work to remind me there’s an opportunity to play, groom or, weather permitting, take a cup of coffee out to the back yard! She all too often gets her way. When we visit a school or virtually any social excursion she almost patiently awaits the opportunity to be told she is off duty so she too can greet her friends old and new with the wagging tail and joyous burst of energy which is her natural grace. A reminder to me so often of the treasure of kindness and friendliness in our world. Each evening she eagerly greets the arrival of Tracy (Mom!) with the enthusiasm of someone gone for weeks. This is only partially because Mom’s arrival heralds the serving of Autumn dinner, mind you. Each evening she encourages the opportunity to be a lap dog and curl up with her family whatever the activity of the evening. Yes, she is undeterred by cross training on the schedule. By 8:00 pm she begins facing us with enormous yawns of Snoopy fame as her not-so-subtle hint she would like us all to retire to bed. She is first to the master bath to sit ever so pretty facing the counter where her treat jar sits. Ever hopeful that we will provide her the nightly reward for being her awesome Autumn self, she will resort to Jedi mind powers if necessary and has been known to still be sitting there waiting when we have gone to bed determined that not every night is treat night. Occasionally we have relented and gone to get her and a treat! Each night she sleeps comfortably in her giant Taj-Mahal of beds in our bedroom unless we make the slightest of entreaties at which point she will, ever vigilant, leap to our request and ensure our pillows and people are snuggled with the lightest and cutest of snores until all are asleep… and then she will mystically spread to take up the entirety of a king size bed! Such is the typical day in the life of Autumn and from such simple roots do I grow the rest of my plans for the new year. Happy New Year everyone, treasure all the little moments frozen in time even as you move forward! 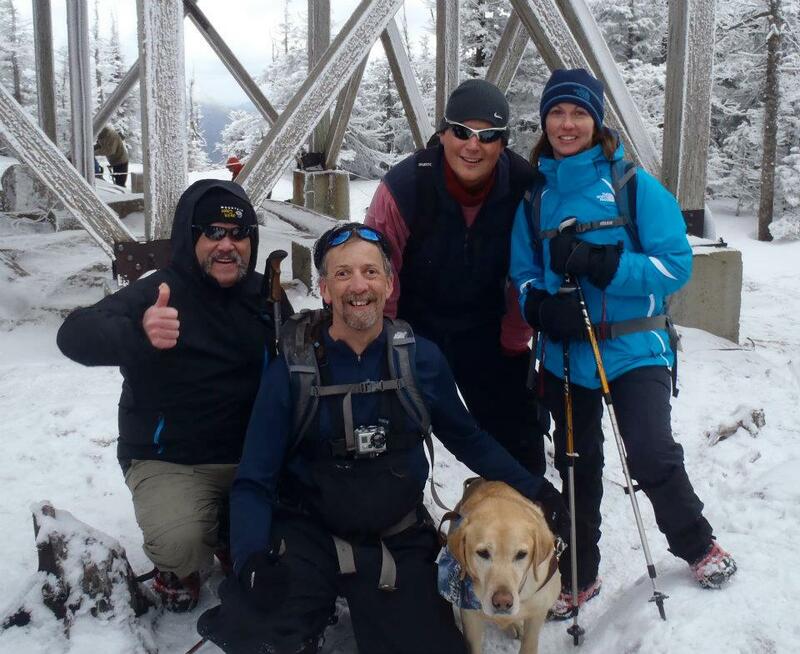 Tags: challenges, disabilities, guest blogger, Inspiration, winter. Christmas is certainly for all ages, though I admit to the appreciating the special enjoyment it brings to children. 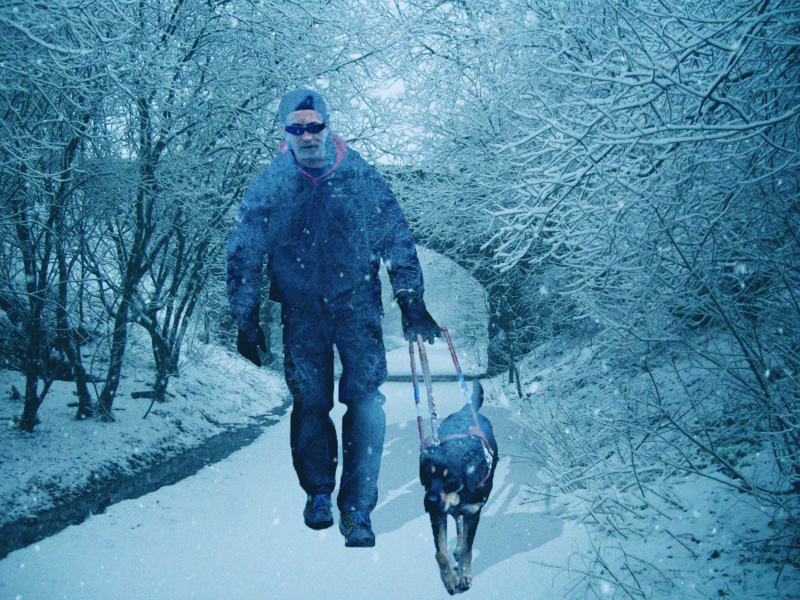 In this wonderful Christmas tale, Jonathan Mosen shares an insightful story of Christmas being for people of all abilities. If you visit the link to his story directly you’ll discover audio versions of the story are available and can share feedback directly with the author. Meanwhile with his encouragement to share this story here is his clever and educational Christmas story. Link to original story here. Reprinted below. A long long time ago, so long ago that even your teacher hadn’t been born yet, so that makes it a really really long time ago, a stylish, shiny elf-driving car pulled into the long driveway at Santa’s busy workshop. Out of the car stepped Mrs Scott, a smartly-dressed elf wearing a business suit and black patent leather high-heeled shoes. They made such a loud clop, clop, clop sound on the cobblestones leading to the gingerbread front door of the workshop, that Harold, the chief elf, heard his visitor coming, even over the sound of all the toys being made and packed. He met Mrs Scott at the door of the workshop, greeting her with a wide smile, a firm handshake and a laugh that was squeaky and high-pitched, yet somehow when you heard it, you could tell it was coming right from his wobbly little tummy. He immediately felt under-dressed in the overalls he was wearing while he was helping out on one of the assembly lines. Yet despite Mrs Scott looking immaculate, and Harold looking decidedly shabby, Harold was the boss, and she had something he needed. “Come in, come in! You must be from the elf-improvement school,” Harold exclaimed. Harold ushered Mrs Scott into his office, and one of the kitchen elves was asked to make her a cup of tea. Making all those toys and sorting them for Santa made all the elves hungry like a wolf, so Santa’s workshop had a big kitchen where all kinds of delicious treats were being made for the elves to eat whenever they got hungry. Mrs Scott had been the director of the School of Elf Improvement for five years, but this was the first time she had visited Santa’s workshop. If elves were ever lucky enough to get a job with Santa, almost no one left. That meant that even though there were many elves graduating every year from the School of Elf Improvement, not many got the ultimate prize, the job of working for Santa. Mrs Scott was at Santa’s workshop on this day, because Harold had called her late one night on her elf-phone, saying that with more children than ever in the world, they could use a bit more help. After the tea arrived, and Mrs Scott had sampled some of the delectable fairy cakes from the workshop kitchen, she opened her briefcase and they got down to business. Mrs Scott took out three beautifully spiral-bound leather folders, with the name of an elf etched in gold on the front cover of each one. “This is Huey”, she said. “Huey loves building musical instruments. During one of his exams, he built a piano, a clarinet, a huge noisy drum kit, a Didgeridoo, a nose flute and a plinkety plankety, all in under an hour. I’ve never seen anything like it,” Mrs Scott beamed. There was something in the way Mrs Scott used the word “special” that immediately peaked Harold’s curiosity. “Oh no,” said Harold, understanding exactly how serious a matter this was. “You get a problem with one of your whizimybobs and it can really set you back. Actually we had a fault with one of our whizimybobs here at Santa’s workshop last Christmas. It stopped a lot of our production for a week because no one picked up on it, and we nearly had to cancel Santa’s delivery altogether”. “He’s very thorough,” said Mrs Scott. “He inspects things with his hands and often picks up on problems making things that we might miss visually. It’s been very useful to us more than once”. Louis arrived at Santa’s workshop the next day, with his little suitcase and his long white candy cane. He put it out in front of him, so he new when he was getting close to an obstacle. If the cane hit a wall or something left on the ground, he would feel it. And after being shown around the place, he soon started remembering where all the divisions of Santa’s great workshop were located. It wasn’t that difficult for Louis. He soon noticed how different the sounds of the machinery were depending on which part of the workshop he was in. Sometimes, his sense of smell helped too. Just like his hearing, it was no better than anyone else’s, but since he didn’t have his sight, he took more notice of what his other senses were telling him. Louis was very excited about meeting Santa, but Harold explained that since Christmas was getting close, Santa was very busy preparing, and usually, elves just starting out didn’t get a chance to meet with the big guy. Louis settled down to work as quickly as he could, but he wasn’t happy. He felt that he wasn’t being given as much responsibility as he was capable of. Everyone was very nice to him, but they just couldn’t imagine how he could do the things that needed to get done if he wasn’t able to see. Louis tried to be patient and explain. Still, the elves found it hard to give Louis a fair chance. It’s not that they meant any harm, they just were scared about him being hurt. Then, one day, a mad panic developed in the mail room at Santa’s workshop. Every day at precisely 29 o’clock, a small earthquake could be felt, as the mail from all the children who had recently written to Santa got delivered to the workshop. The mail elves had an efficient system of sorting through the mail, and making sure that all the requests from the girls and boys got put on Santa’s list. At the end of every day, Santa would always check the list twice, to be sure all the good children had their requests noted. But today, the mail elves had a problem they didn’t know how to solve. They had received a group of letters that were nothing like they had ever received before. The mail elves prided themselves on being able to read every single language in the world. But these letters had them stumped. Rather than being written with squiggly characters on the page, these letters felt all bumpy. Hannah, one of the mail elves, said the pages reminded her of her teenage brother Brad, who was having a major problem with pimples. The pages, she said, looked and felt a bit like Brad’s face. “Do you mean kids are now writing to us in pimple?” said Harold, who had been put in charge of solving the issue because of how urgent it was. “I don’t think any child would be quite that dotty,” Hannah replied. “But I think we need to call an elf-development meeting, to see if anyone can solve this problem. Because Santa has made it clear, we need to do whatever it takes to make sure all girls and boys who write to us have their requests read, even if we can’t always grant them all”. Elf-development meetings didn’t happen very often so close to Christmas, but this was an emergency. All the elves from around Santa’s workshop stopped what they were doing, and gathered together at exactly elve o’clock for the big meeting. Harold held up a page of the dot-filled writing. Everyone stared, first at the dotty page, then blankly back at Harold. No one had any idea what the writing was, or how to read it. Louis’s little ears pricked up. He couldn’t see the sample, but based on the description, he was pretty sure he knew what it was. “May I please feel a page of that writing?” Louis asked. Harold handed Louis a page filled with the dots. Louis took the fingertips of both index fingers, and started gently running his fingers across the page. He began to speak. “How did you do that, and more to the point, what is that dotty stuff?” Harold asked. The elves were happy because, thanks to Louis, they could make sure that all girls and boys, including those who read Braille, could get their presents on Santa’s list. Louis spent a lot of time in the mail room after that, but that wasn’t all he did. The elves realised that just because you’re blind, it doesn’t mean you don’t have valuable skills that others may not have. They realised that Louis just did things differently. Not better, just differently. Soon, Louis was also put in charge of whizimybob inspection. The elves used to be worried that Louis would hurt himself, because whizimybobs have so many moving parts. But they knew that Louis was careful and capable, more capable at that particular job than anyone else. One day, Harold came into the mail room to find Louis. “The big guy wants to see you Louis,” Harold said. Louis timidly knocked on Santa’s office door. “Ho, ho, ho!” came the reply. Louis opened the door, and walked into the office, which seemed to be shaking. It turns out Santa was happy to see Louis, and Santa’s enormous belly-laughter was making the whole office bounce up and down like a carnival ride. “Gift?” said a puzzled Louis. And all these years later, every year, when he’s not looking after those pesky whizimybobs, you’ll find Louis in the mail room, making sure that all the Braille letters from blind children all over the world are making it onto Santa’s list, and being checked twice. Which just goes to show, there’s nothing you can’t do, as long as you believe in your elf. Tags: community, Hiking, Inspiration, Randy, success, Support, winter. I attribute many of my successful accomplishments to the positive results of teamwork. At the most basic daily level my teamwork with my dog guide enhances my life tremendously and I’ve learned to find, build, maintain, grow and enhance teams along my journey and it has taken me to incredible heights. I’ve long supported the suggestion of team as an acronym: T.E.A.M. – Together – Everyone – Achieves – More. Since my childhood, I’ve been a fan of football for the blending of strategy, myriad athletic types, and exceptional reliance on teamwork for success. I have always had an appreciation for the hard-working over-achiever and strive to emulate that personally. The New England Patriots were my home team and for much of my life were not particularly successful, but still I enjoyed the lessons I learned about teamwork. When the ultimate team player for me joined our squad in 1996 and happened to share my birthday, I quickly became a Tedy Bruschi fan, though it was the 2001 team which reminded a nation in their famous “choosing to be introduced as a team” entrance to the Super Bowl just how much value comes from learning to work together to lift each other up to better than the sum of the individual parts. Sixteen years later, most of the individuals have been replaced multiple times but the team’s first approach and success have sustained. Regardless of the team anyone supports or even an interest in the sport, there’s a worthy lesson in Bill Bellichick’s quote which is valuable in all of our life approaches. Simply put, there is tremendous value in being the best individuals we can become and we will likely gain much success for personal development. Ultimately, however, the greatest accomplishments and the lasting success for the long term are more commonly achieved by learning to build our team, maintain our team and work together towards the important goals. At the behest of several conferences, I’ve developed workshops on these approaches to “team” which are beyond the scope of a single blog. I will say that commitment and communication are essential components. The specific methods adjust for the varied types of people, circumstances, and goals as well, but if we want to reach the pinnacles of accomplishment, it is worth the effort. All that said, it is Super Bowl week and even in my actual football fandom I think you’ll find this Sports Emmy Award-nominated piece from 2007 showcases how community is involved in my approach even to fandom. Community, after all, is just another type of team! Along the way you might find some emotionally charged moments about my life as well including my description of the very last moment of sight I ever had in this world. Enjoy! Tags: Hiking, Inspiration, outdoors, Quinn, Randy, winter. 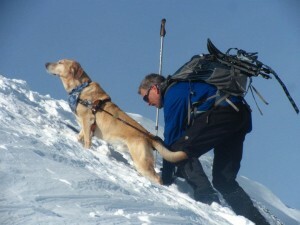 Randy and his former Guide Dog Quinn climb one of the NH 4,000-footers during the winter of 2011-2012. Quinn passed away in January 2014. For me the winter of 2016 has finally arrived. 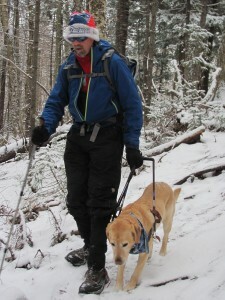 Shortly before Tracy, Autumn, and I departed for the New England Visually Impaired Ski Festival at Mt. Sugarloaf in Maine, the first appreciable snow arrived to our home in Nashua, NH. 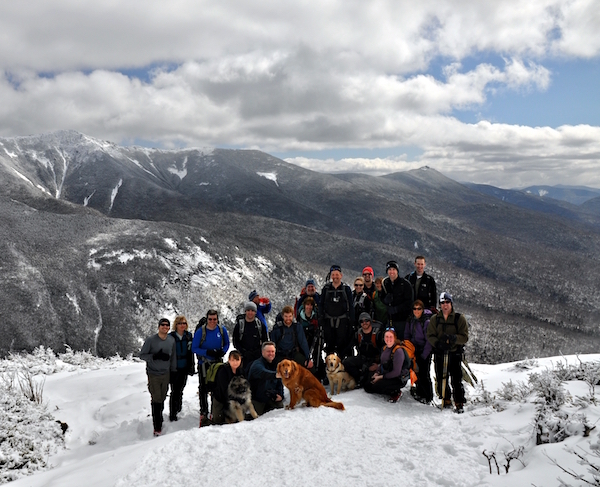 Travelling north and into the mountains of Maine, we encountered more snow, though still a winter with considerably lower than average snowfall. Shortly after our arrival more snow was delivered, and several days of skiing later it felt like winter had arrived. Returning home reinforced this as another snowstorm arrived and our first deep freeze of below zero temperatures soon afterwards. Sitting by the fire with a cup of coffee, my mindset turns to the winter of 2012 and the epic hiking experiences. 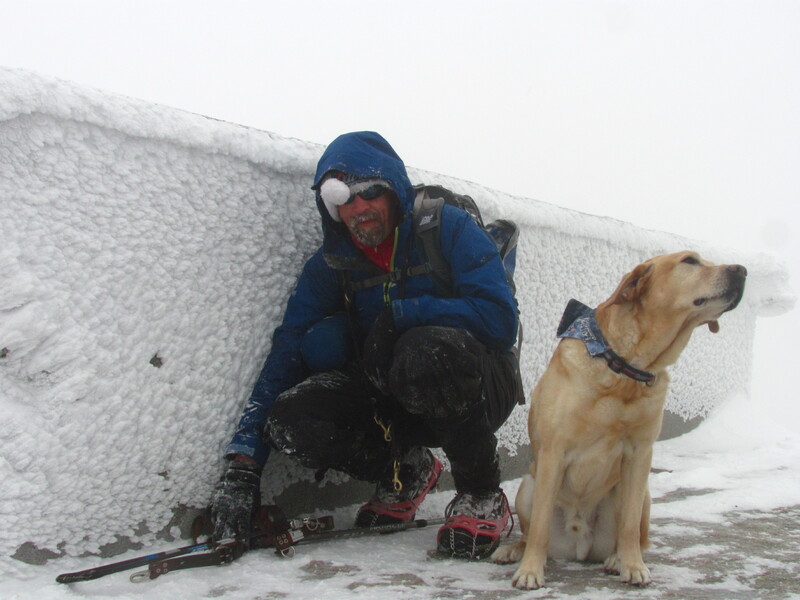 I’m recalling Quinn and me adapting to the notion of winter hiking and solving the challenges in order to receive the rewards available. In my quiet moments, I bask in the nostalgic recollections and occasionally seek out a blog from those times to help me experience the moments again. Where do you explore in your cherished nostalgic moments? 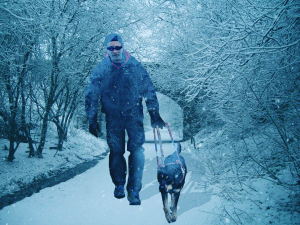 Tags: challenges, marathon, outdoors, Randy, running, success, winter. Jose and Randy run the California International Marathon in December 2014. 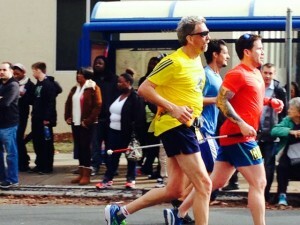 I was excited to announce that my good friend and fellow 2020 Vision Quest Board Member, Jose Acevedo, would be running as my guide for the Boston Marathon. But now it’s time for the discussion of some details. Just making the announcement won’t help either of us run the Superbowl of road races. It takes a plan and plenty of hard work in implementing the plan. Most marathons require roughly 18 weeks of training in order to prepare for the endurance experience impact upon the body. Running it as a team requires being in synchronicity sufficiently to ensure the best chance of success. So Jose and I reached out to Greg Hallorman, a good friend and excellent run coach. 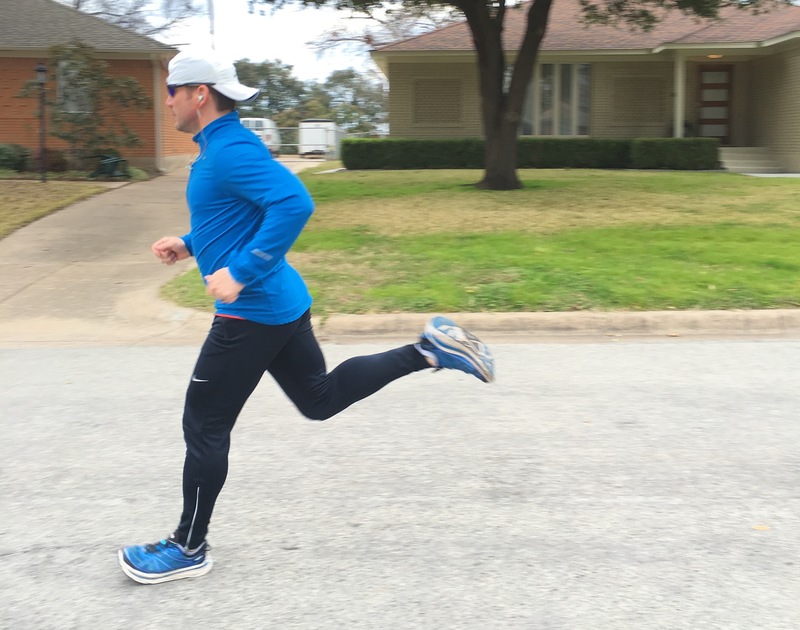 We use a modified version of the Hal Higdon training program with a few lessons from our past marathon experiences. Having very successfully run the California International Marathon together in 2014, we understand fairly well how to work together. There is an additional burden on my guide to be able to find their comfortable pace for not only running their marathon but having the reserves mentally and physically to be my guide. This includes the breathing room to call out warnings of obstacles we might not be able to simply steer around such as a pothole or manhole cover. It involves tracking not only the pathway they are running, but the wider path for me with an extra bit of attention to provide warning time for me when those obstacles cannot be avoided. The guide often has to alert other runners of our presence and the visual challenge to help us be good citizens to our fellow runners. 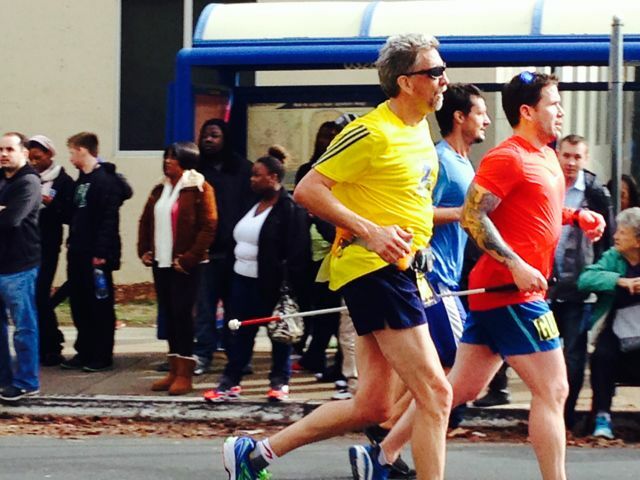 On the very crowded Boston course this can be an especially significant challenge. Given these factors, Jose set our goal race pace as 8:40 minutes/mile as our target. This was the basis for our plan. Added to this is the expectation that four days per week of running was the right and reasonable limit for the rest of our busy schedules. This does not mean that we only train on four days, however. There are two additional days of cross training for roughly an hour each time. These days help develop a different range of muscle motion, enhance our cardiovascular conditioning as well as hopefully support our body clearing lactic acid build-up from the running. Jose often uses his Kilimanjaro favorite of stair climbing at his high-rise office building, I tend to visit my local YMCA and put the time on an indoor bicycle. Many alternatives can exist to help supplement the core run training with cross training. Jose on a training run. *Thanks to Rick Perreira who drives me to the YMCA Each Monday Morning, helps me with the touch screen cycles and takes me home! *Thanks to Tracy for pushing me and helping with the timing on the key points of this hard workout! *Thanks to Alex Newbold who drives me to the YMCA each Wednesday morning, helps me with the touch screen cycles, and takes me home! Thursday: 6 miles of “tempo run,” meaning 2 miles of warm-up at 9:00 minutes/mile, 3 miles of “lactic threshold”at 8:10 minutes/mile, and 1 mile cool-down at reduced/recovery speed like 9:30 minutes/mile. * Thanks to Matt Shapiro who works hard to give me this very early morning speed push most Thursdays! Friday: My one rest day to recover and prepare for the weekend push! 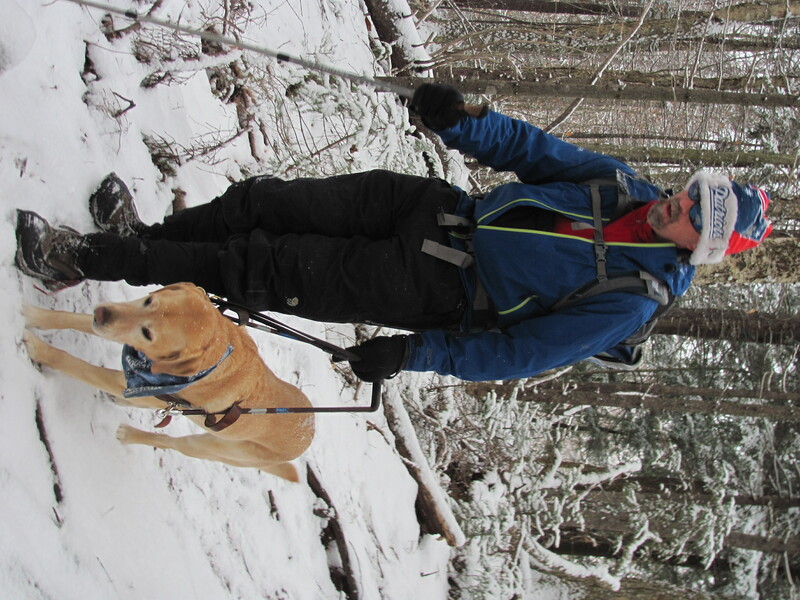 * While we often switch Saturday and Sunday, Rob Webber has been steadfast on longer and faster runs with various guides or treadmill options for the other day as necessary! Those weekend-long runs will rise to 20 miles and as the snows fall, roads become icy and temperatures can drop; training for Boston is simply a challenge. Meanwhile my counterpart in Jose will contend with Texas temperatures and we check in with each other regularly to see if our progress remains encouragingly comfortable. All this work for an incredible celebration together as we share the legendary experience which has become the Boston Marathon. Hopefully some of you will be helping us out with encouragement throughout the training and especially on our big day.